Forbes Magazine’s annual list of billionaire club members is re-arranged. 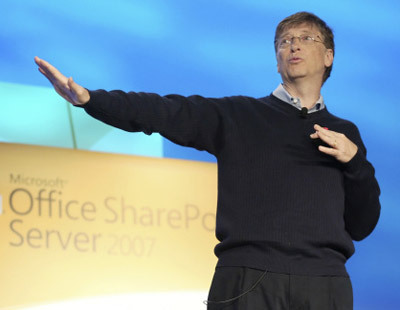 Microsoft Chairman, Bill Gates, is no longer the richest man on the planet. With an estimated net worth of $US62 billion, Warren Buffet, Gates’s bridge partner and philanthropy colleague, unseated Gates, who held the number one spot for the past thirteen years. Gates, who resigns from his daily duties as Microsoft Chairman this summer, to explore his creative capitalism theory and head permanently into a full-time philanthropy career, is now worth $US58 billion. Critics are pointing to a sharp 15% decline in the software giant’s stocks, following its bid for Yahoo! early last month, as one of the reasons Gates is forced to move out of the way and make room for the Omaha financier. In second place on the billionaire list is Mexican telecom guru, Carlos Slim Helú, who is up four billion over Gates. A whopping 1,125 billionaires are part of the club this year, fifty of them under the age of forty. Among the billionare youngens is, self-made minter, and Facebook founder, Mark Zuckerberg. The 23 year old quickly piled $US1.5 billion into his coffers since the creation of the social networking site. Despite his removal from the top of the food chain, Gates does not seem bothered. The Harvard dropout who co-founded Microsoft over thirty years ago, is considering a space tourist tour, which will cost $US25 million. Additionally, the surge in his Berkshire Hathaway stocks, which upped Buffet’s fortunes by another $US10 billion, encouraged Buffet to pledge a significant endowment into the Bill and Melinda Gates Foundation. Essentially, the rich friends are simply passing their monies around from one pocket to the next. Never mind their positions on the hierarchy, they are still filthy rich. Women in the club include Oprah Winfrey and the only author who ever made it on this list, JK Rowling, who penned the Harry Potter series.